Just back from Penn Relays... Wow! The Grand Prix of track meets did not fail to deliver, even in an off-Olympic year. Yes, there were fewer world class athletes, and fewer world class relay teams, but to be expected in an off year. The atmosphere was still the usual festive Penn Relays, and certainly the crowds didn't stay away... 100K+ over three days for the eleventh year in a row! The highlight of the meet is always the USA vs. The World events. The climax event is the 4x400 near the end of the day Saturday. And talk about climaxes! This was the wildest 4x400 I've seen at any level above AAU. The teams participating were, of course, the USA team anchored by 4x400M 2012 Olympic silver medalist Manteo Mitchell... the 2012 London gold medal Bahamian team, all four still together... Brazil, anchored by South American Games silver medalist Hugo De Sousa... the always dangerous Jamaicans with some pretty fresh athletes on the world stage... and the team from Nigeria, anchored by African Games gold medalist in both 400M and 4x400M, Amaechi Morton. 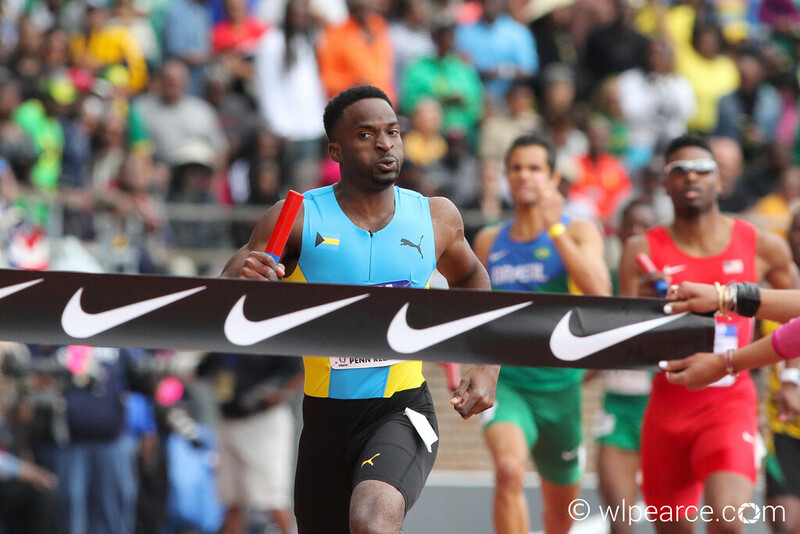 Pinder kept up the pace with an even faster 44.7 second 400M to put the Bahamians out in the lead as he passes here to three time Olympic medalist Chris Brown. 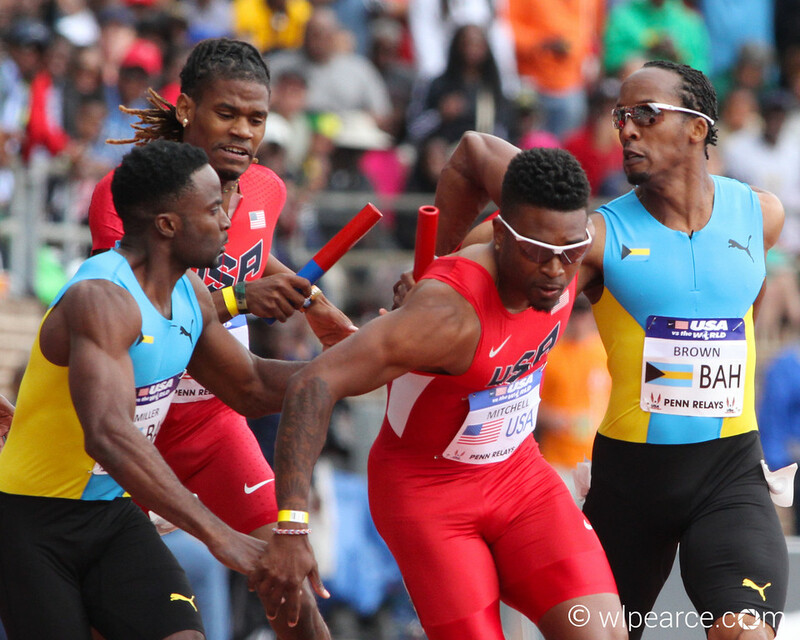 At the beginning of the third leg, the Bahamians were out in front of the USA team by the margin you see here. 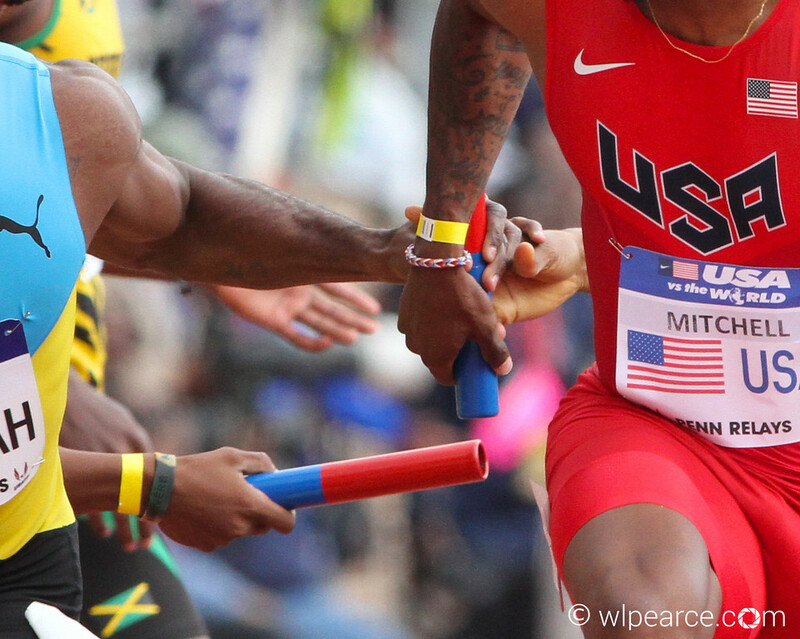 The baton passes happened almost simultaneously, but with the Bahamians passing out in front of the Americans. Now both teams had to cross to make their passes. 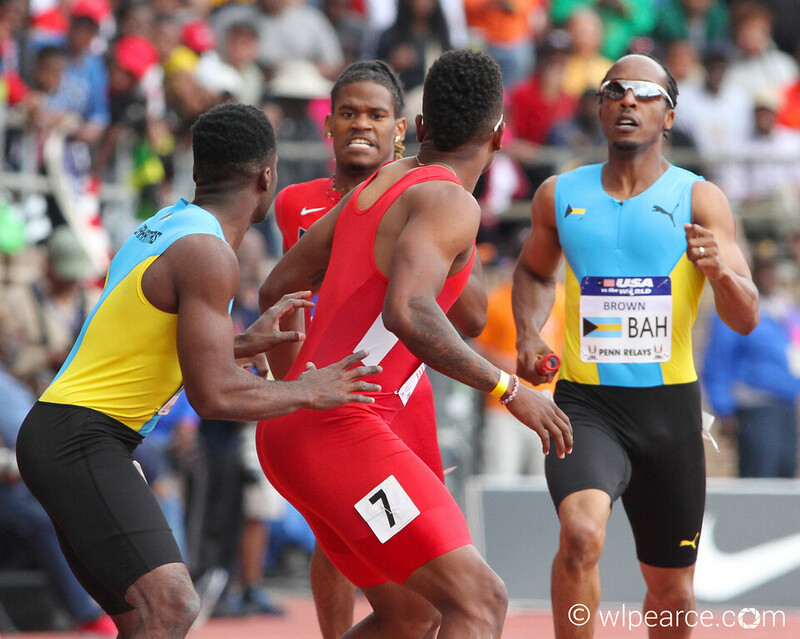 Looking for an advantage, American Manteo Mitchell tried for the 4x100M style no-look pass. 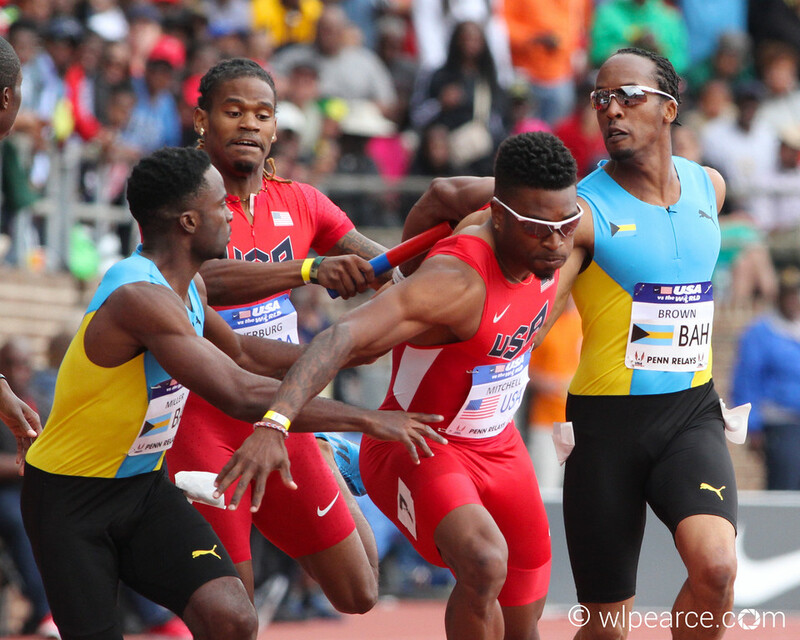 Two time 4x400M Olympic medalist Ramon Miller opted for the more secure 4x400M style look-back pass, which in this case turned out to be the difference in the race. 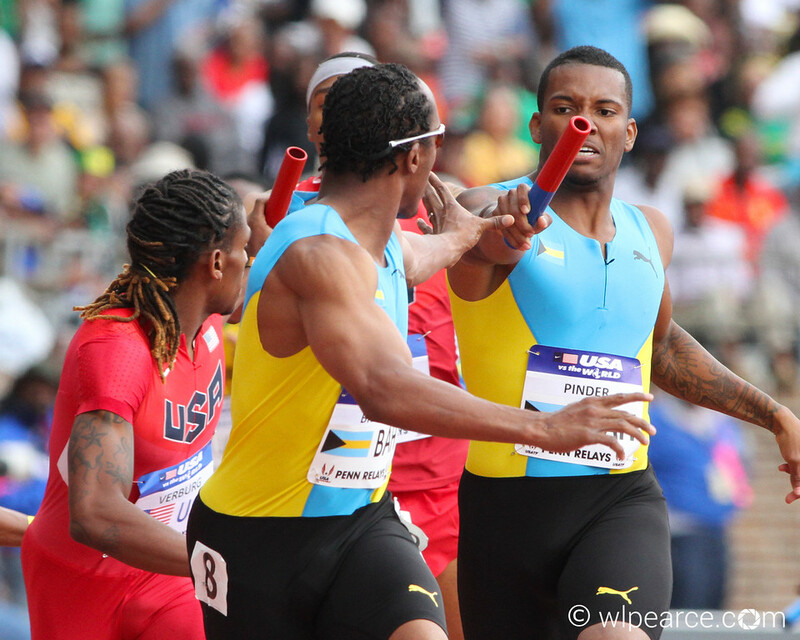 At one point, there were three hands on one baton! Everyone knows that just isn't right! 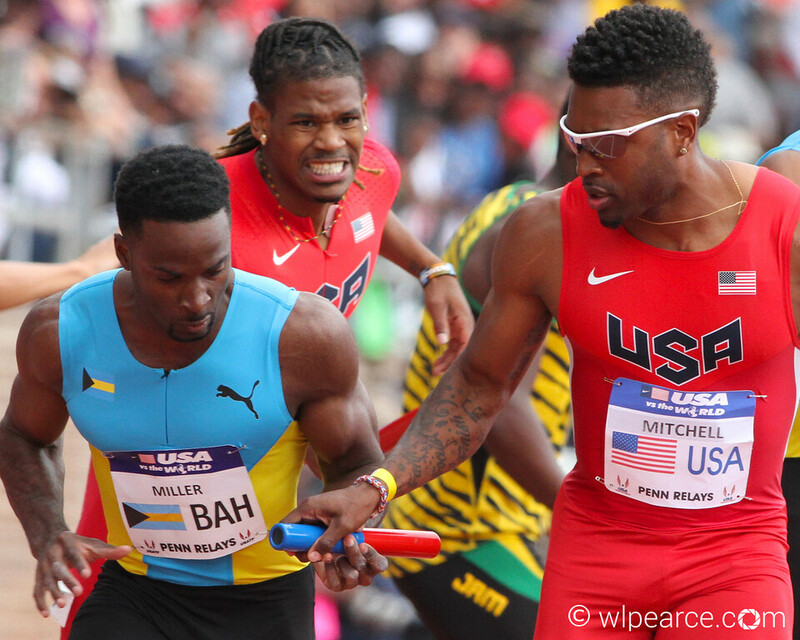 There was nothing for Mitchell to do but let go, turn around and get his team's baton while Miller hit the jets for the anchor leg. 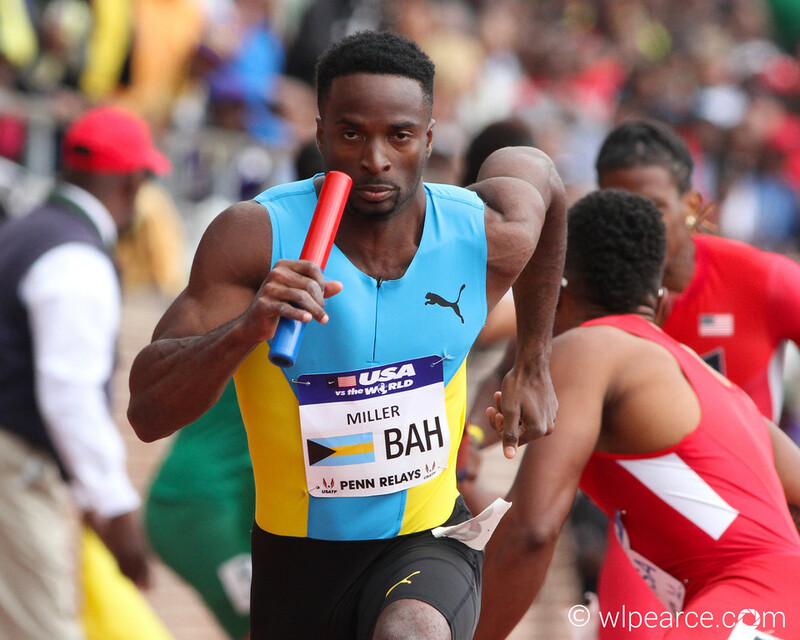 That created a gap that Mitchell simply couldn't overcome, as Miller broke the tape for the Bahamians. What a wild 4x400! The next two years should be interesting to watch in the run-up to the 2016 Olympics. 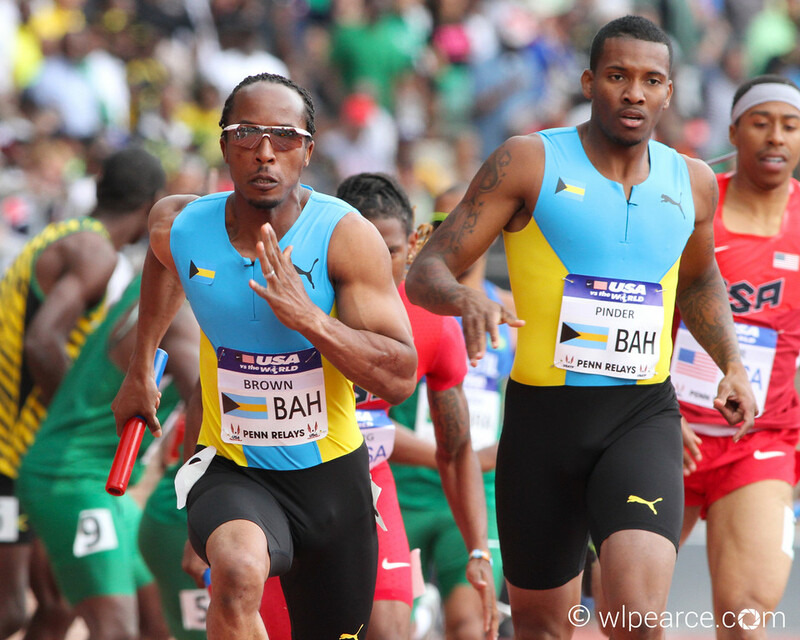 Will the Bahamian team stay together and repeat a Gold in 2016? That would be an extraordinary accomplishment. Congrats Bahamas. Condolences USA. That's just the way the cookie crumbles (or the baton passes) sometimes. 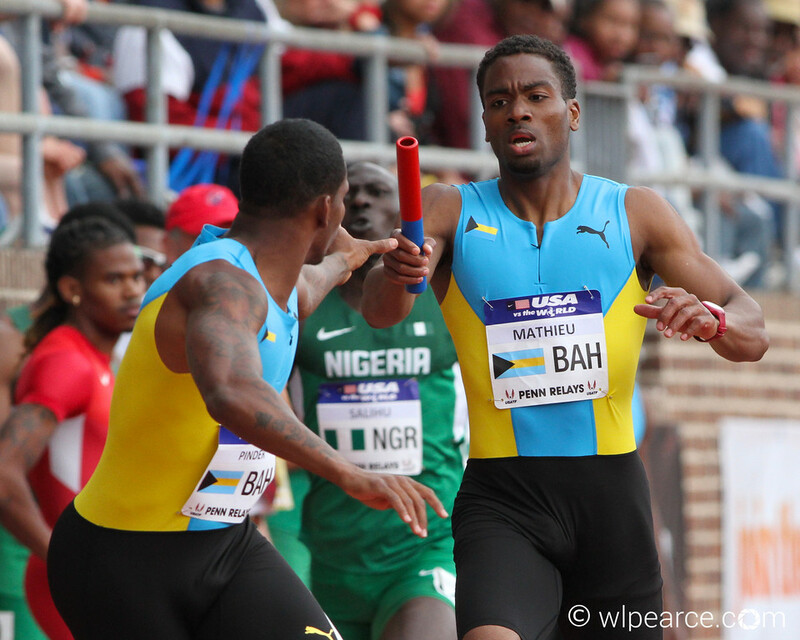 See more of 2014 Penn Relays here. See much more at wlpearce.com where it's all about the photos! Enjoy! Also, check out our Facebook and Twitter feeds for daily photos and upload notifications. I saw this race in person and these pictures are the best capture I ever seen. Great Job!!! Thanks for the kind words. It was definitely an exciting race! Very nicely done Mr. Pearce!